I like this whole idea to inventing my own recipes. Of course, when time is on my side, not always though, whenever I can squeeze in pretty much. Inventing recipes by far is my proud moment to food happiness (Malaysian Lamb Curry Noodles). Call me the recipe inventor or recipe influencer (Grilled Chicken Wings & Baked Cornflakes Chicken) if you feel you should. Thus, henceforth, therefore, my this time invention is Curried Roast Chicken (Chicken Curry Potatoes & Indian Chicken Curry). Chicken of course is the main highlight, but instead of one whole chicken, I opted for two pieces (Honey Chilli Chicken, Chicken Wanton Soup & Chicken Feet Salad) due to me dining alone. Nothing worrying, nothing nor intimidating, neither you should be over concern, over the word curried. Not for my recipes though. Basically, you make this Curried Roast Chicken (Cashew Masala Chicken, Butter Chicken, Sesame Chicken & Sweet Chilli Chicken) with your pantry friendly ingredients I reckon. Obviously curry leaves scented. Yes, curry leaves for roast chicken. Remember, I already told you, my invention? What shouldn't we use curry leaves for a roast, you tell me please? Curry leaves coupled alongside curry powder, ginger juice, garlic juice, onion juice, oil and salt. Crispy utterly on the outside, tender bite inside, and amazing curry leaf scented Curried Roast Chicken. Rub chicken pieces with all the ingredients except oil. Gently poke with a fork to sip the ingredients inside. Marinate for at least 4 hours. Smear a baking pan with oil and place the chicken pieces inside alongside the marinated ingredients. .
Bake on a preheated oven (10 mins) at 180C (more of less) for about 50 mins or until chicken is cooked and crispy on the outside. Not a good idea to see to read this when you're hungry.. I'll try this soon! This marinade does have some delicious ingredients, it is warm enough here to grill-so I am inspired by this. Love the plating with all the greens too! Have a great day! This chicken must be really tasty! All the flavours you used in the marination are awesome. I will keep in mind to use curry leaves next time. How did you juice the garlic? Thanks for all the sharing everyone. Bal - ginger juice is extracted either by pounding or blending some pieces of ginger. Looks delicious! I've never actually worked with curry leaves, just curry mixes. I wish i could lay my hands on them here! 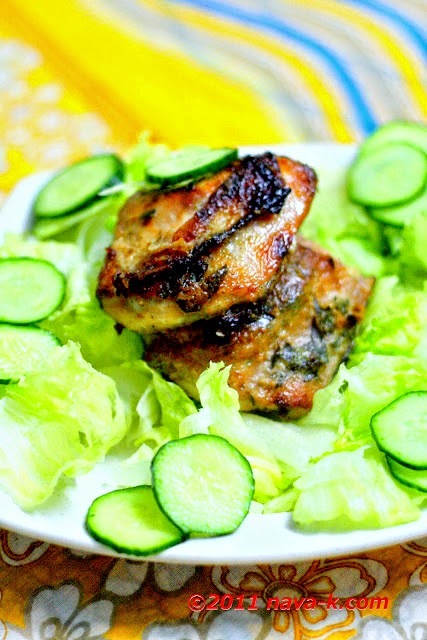 This is definitely one flavorful chicken! I got to try cooking with curry leaves! That looks absolutely amazing--I can't find curry leaves here to save my life. I would love a plate of that chicken! Wow! I liked it! Thanks for sharing.. The chickens look juicy and tender! Can I have a piece plz? Nava this looks delicious! I LOVE baked chicken....one of my favorites! This looks like a tasty recipe. Will have to give it a try with some curry leaves from my garden. Gosh, this looks like another mouth-watering dish! I love cooking with curry leaves but haven't tried baking with them. Yum! This looks delicious. Definately it has some Indian flavors. This reminded me of Indian classic Tandoori chicken. Never baked chicken with curry leaves. Thanks for sharing the idea. Looks good and simple. Thanks.